The Chair, Birgitta Sacrédeus welcomed participants to the meeting and invited everyone to present themselves. She informed attendees about the logistical arrangements. The agenda of the meeting was adopted as proposed. The purpose of the meeting was to raise awareness and exchange good practices in the field of active and healthy ageing. 1. European Innovation Partnership on Active and Healthy Ageing – what’s new? Mr. José Angel Martinez Usero from Funka, working on the PROEIPAHA, the support action to the European Innovation Partnership on Active and Healthy Ageing (EIP AHA), started his presentation with outlining some of the challenges that European regions are currently facing, especially the demographic challenge as well as the opportunities for businesses and regions that they create. Mr. Usero introduced the EIP on AHA, a stakeholder-driven knowledge management initiative launched by the European Commission, which aims to engage and connect public and private stakeholders across different sectors that compose the innovation value-chain The EIP AHA is articulated through 6 Action Groups and 72 Reference Sites that consist of individual commitments and collaborative works of different maturity levels. The Reference Sites include regional and/or local government authorities, cities, hospitals/care organisations, industry, SMEs and/or start-ups, research and innovation organisations and civil society, that intend to provide comprehensive and innovate approach to active and healthy ageing. programmes as well as exchanges of ideas. Another output is the continuously growing Repository of good practices containing data for over 600 standards and processes. To conclude his presentation, Mr. Usero introduced the two different procedures available to join the EIP on AHA. The first option is to submit a “commitment”, consisting of projects and initiatives that will be implemented in the coming 3 years. The commitments are organised within Action Groups, and must be in line with the overall priorities of the EIP on AHA. The second possibility is to apply to become a Reference Site. The call for Reference Site is open every 3 years, with the next one in 2018. Becoming a Reference Site involves creating a quadruple helix ecosystem in your region, which delivers and presents innovative and workable solutions for other organizations. He introduced the “Commitment Tracker Tool” where member organisations can follow the work and progress of other partners. Finally, he invited the participants to the “European Summit on Innovation for Active and Healthy Ageing” which will take place from 5 to 8 December 2016. The Chair invited participants to send potential questions via e-mail because Mr. Usero had to leave the meeting due to other commitments. Mr. Francesco Benvenuti and Mr. Andrea Sanquerin presented the Tuscany Adapted Physical Activity (APA) Programme. This programme consists of physical activity programmes carried out in groups, adapted to the functional status of participants. There is a large body of evidence indicating that many diseases, disabilities and premature deaths can be prevented by the adoption of healthy life styles, where physical activity is recognized to play a primary role. Therefore, the region felt that it was necessary to organise a programme outside of the health system to reduce the burden of overcrowded rehabilitation centres. To respond to the current challenges, Tuscany Region has worked to make the APA programme even more specialized to individual needs. Consequently, two years ago they implemented this programme for hypomobility syndromes and osteoporosis and chronic syndromes with stabilized outcomes. The program is widespread and categorized as low cost. Agreements were made with various sport associations as well as with catholic churches, which resulted in space adaptation to the gyms. The effort has been recognized by the Italian government, which promoted the APA programme through national guidelines. Subsequently, the following actions were approved as part of the prevention plan 2014 – 2018: the Project 18: Adapted Physical Activity (revision of exercises programs and regulations) and A Vital Component to Healthy Aging (Community The secretariat for the Interregional Group on Health is provided by EUREGHA asbl based exercise for Chronic Diseases Management). More information regarding the project and its achievements can be found on the EIP on AHA website. Ms. Brigitte Van Der Zanden, director of EUprevent, presented the Euregion Meuse Rhine (EMR) Cross-border project: “Senior Friendly Communities”. EMR consists of 5 regions presenting substantial differences in healthcare, legal and political systems. The mission of EUprevent foundation is to improve the quality of life of the EMR citizens, through the cooperation of numerous health organisations in the region. One major challenge faced by this territory is that young people are moving to big cities and that many of the residing senior population needs health services. Data shows that there is an increase of cases of dementia, mental suffering and chronic diseases in the region. EUprevent has recently initiated a project on community level for seniors and their informal caregivers (husband, children and neighbours) to support them in daily lives. In her presentation, Ms. van der Zanden explained that their project is based on the three pillar (participation – health – safety) theoretical framework taken from the WHO framework on active ageing. The priority areas are eHealth, participation, teaching informal care-givers, lifelong learning, making connections between service providers and communities. 1. Selecting communities that aim to become more senior friendly (currently there are 30 communities, with 18 on the waiting list). This requires community needs assessment and preparation of an “activity buffet” (adaptation of activities, translation and training of staff). 2. Selecting activities based on the assessment results. Every community can select activities from the buffet. All practices are made available in three languages and are adapted to the system. The project will help to implement activities that can come from other communities through provision of staff, material and advice. 3. Implementation of activities and assessment of their impact. Subsequently, the development of durability plan for the EMR. There is a lot of data available at the national level. Unfortunately, not all data is comparable across countries, therefore, the project aims to define indicators better and collect data throughout the project. In the long run, the project aims to obtain comparable socio-demographic data. As a short-term objective, they are collecting information on dementia and depression in the EMR. There was an agreement across the border with national data institutes to use the EMR as a pilot project to drive change. They have developed a 10-year plan with the data institutes to present data on several indicators in the EMR region annually. The Chair thanked the Committee of the Regions for hosting the meeting and the speakers, as well as reiterated the importance of active and healthy ageing. She closed the meeting by inviting the participants to join a healthy networking walk in Park Leopold. 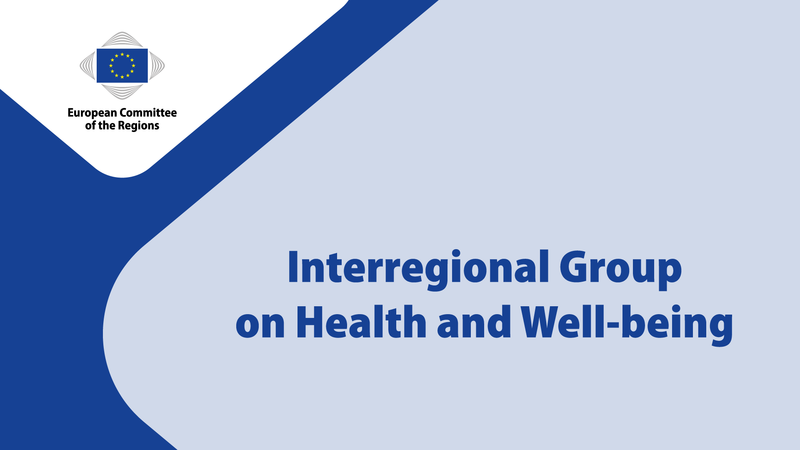 The next meeting of the CoR Interregional Group on Health and Wellbeing will take place on 8 December at 8:00-9:00 on the topic of “eHealth”. Interpretation will be available in Spanish and Italian. Further information about this meeting will be circulated soon.